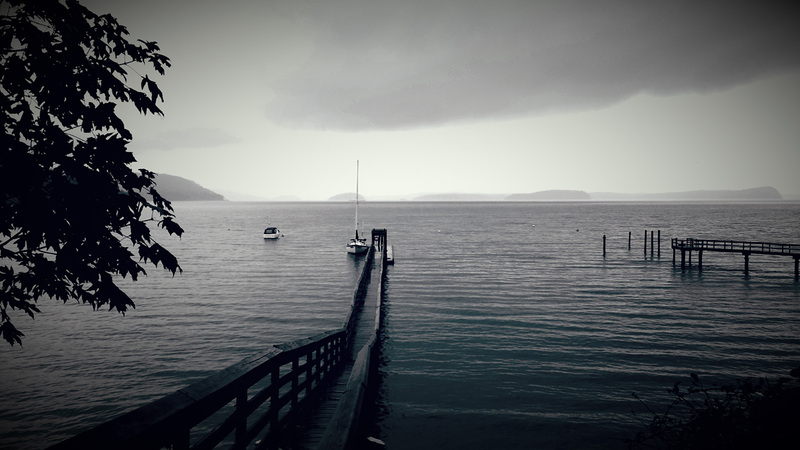 This is the dock off the little hamlet of Olga on Orcas Island, Washington. We had mail sent there general delivery because the post office is across the street from the water. That’s our boat, Carmana, at the end of the dock. OK, I may be biased, but my fiance, Natalie, writes a great blog over at The West County Bramble. She’s been doing a much better job than I have posting about our day-to-day travels. Here’s a link to her post about our stop in the little town of Chemainus, BC, on Vancouver Island, where we happened upon a First Nations (Canadian native peoples) ceremony as well as a very well done musical. Both were quite unexpected. The town is full of murals. Below, Natalie sneaks into the scene of one of my favorites. 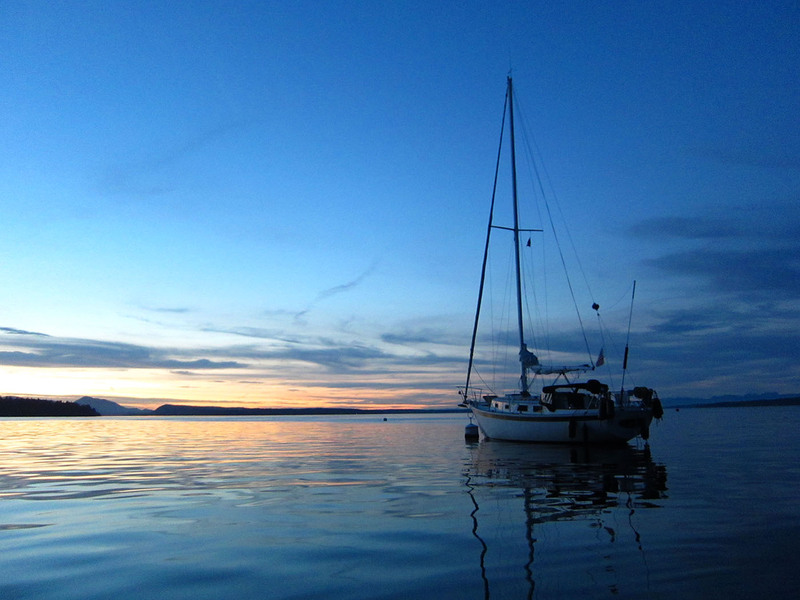 In the top photo, our boat, Carmana, lies just offshore in gorgeous twilight. Well, a few weeks ago we were on relatively remote Wallace Island. 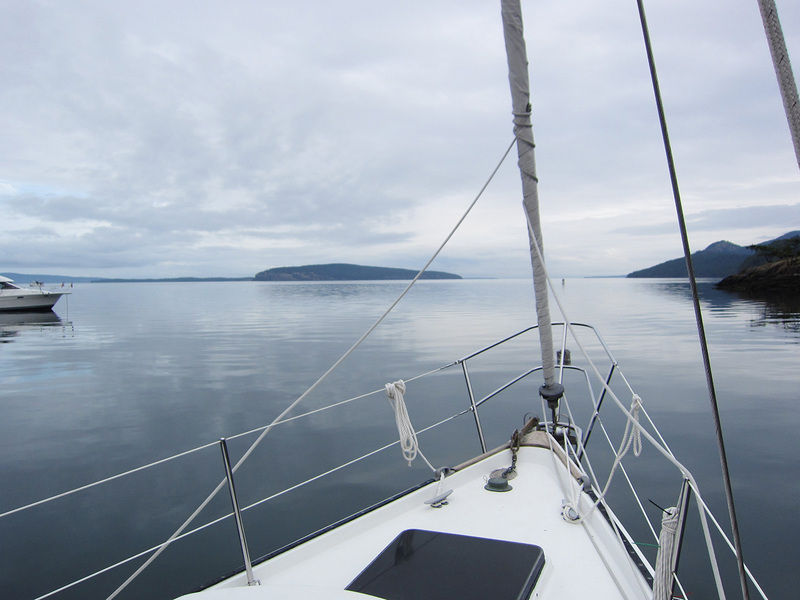 It’s a 200-acre silver of land in the Gulf Islands in British Columbia. It’s not on the ferry route so you have to get there of your own devices. We stern-tied our boat, Carmana in tiny Conover Cove and had a walk around. We’d read about this place in the book Once Upon an Island, at home in West County last winter, so it was nice to finally make it up here and see it on a glorious summer day. Then, come evening, we rowed to watch the setting sun, and made something extraordinary happen… we got engaged. You may have seen Natalie in posts of our trips or seen her photos. She’s amazing. I’m looking forward to life of adventure together. Woo-hoo! Natalie wrote about it on her West County Bramble blog. 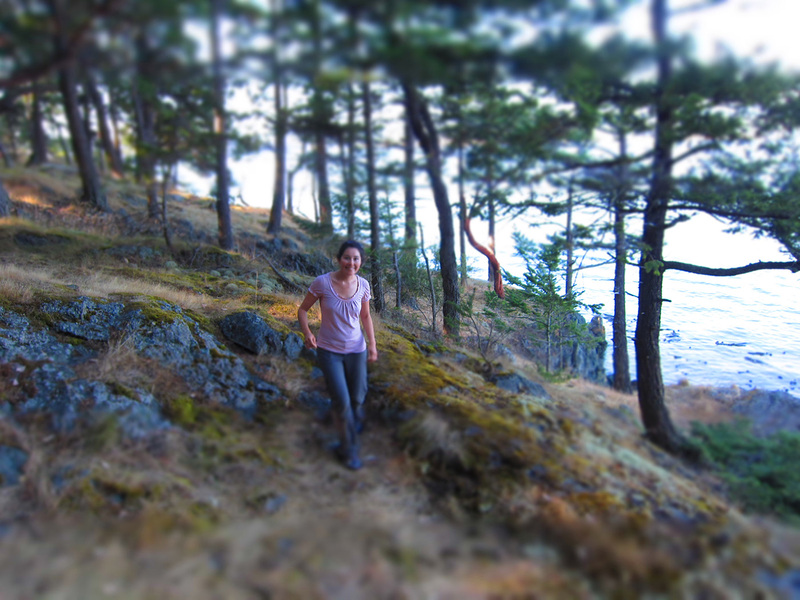 Check out the Wallace Island post in two parts. Part 1 and Part 2. 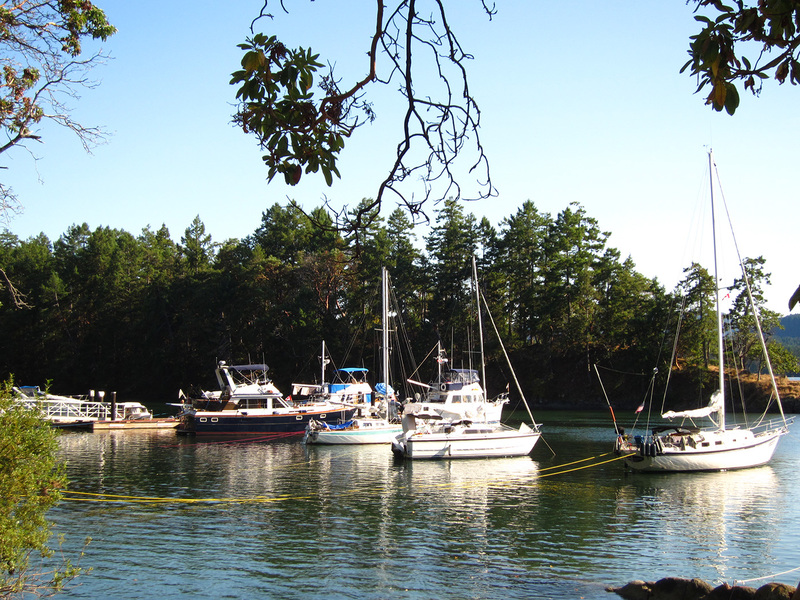 We’re up on Vancouver Island on the west coast of British Columbia. 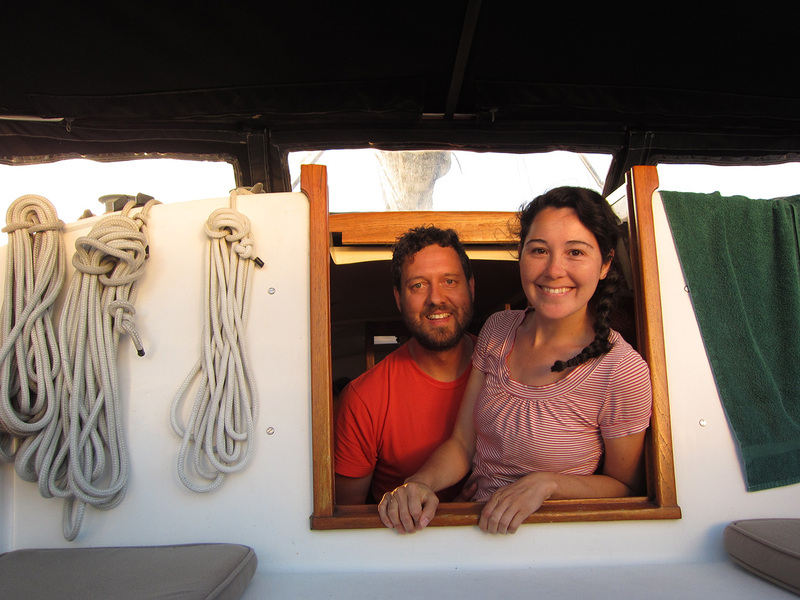 Monday, after months of planning, we left the Bay Area, our truck loaded with supplies for our months-long sailing trip, en route to meet a boat we’d never seen, except for its online profile. 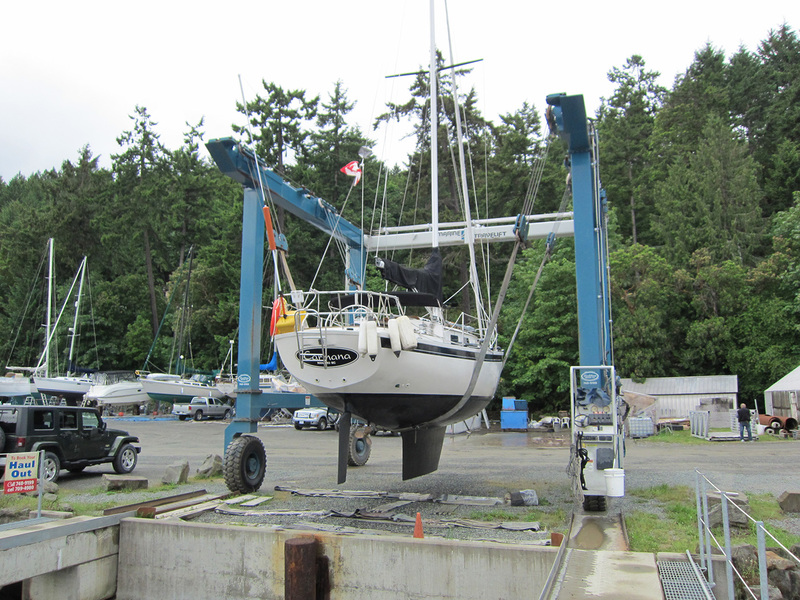 After several trips up north and still no boat, we found an an Aloha 32, a well-regarded, Mark Ellis-designed, cruising boat named Carmana, on Vancouver Island. In mid-May we decided to make an offer. Shortly thereafter we hired a surveyor to assess the boat. We waited a bit anxiously for the day of the survey. When that day came, however, the surveyor pronounced her a well-found little ship. All systems were go. Sailing catamarans have come a long way since the Hobie Cats of the 1960s. Today’s America’s Cup cats literally fly over the water on hydrofoil daggerboards and rudders, reaching speeds over 40 knots. That’s an absolutely incredible speed for a sailboat. I used to sail my old Prindle 18 across SF Bay and we did maybe 15—18 knots and that was thrilling. We’re also hanging off the side! The video above features the massive AC72, Oracle’s 72′ boat. The one below features the smaller AC45. Contemplating life at sea? Here’s sweet little video about living aboard. Thinking of heading out to sea? In these videos a few guys trailer a boat to the Pacific Northwest (specifically the San Juan Islands) and do just that. Parts 2 and 3 after the jump.